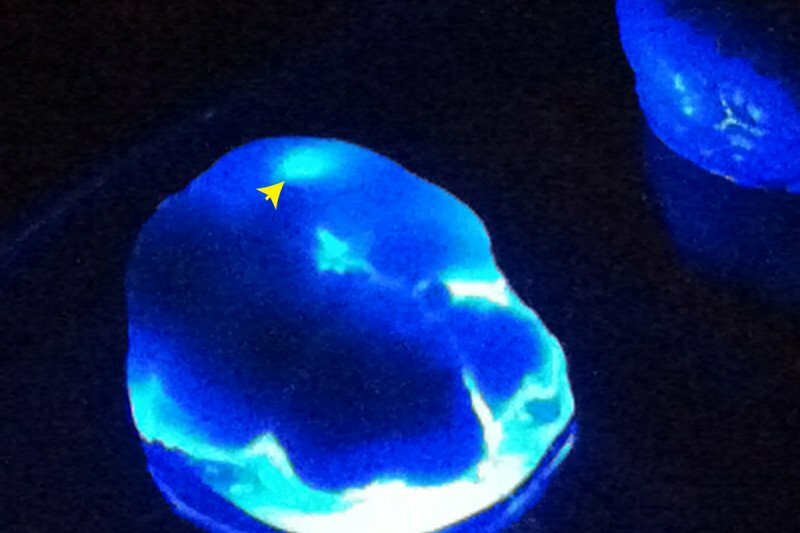 Fluorescence image of an experimental brain tumor (indicated by arrow) originating from iPS cells. Regenerative medicine is based on the idea that stem cells could be used to regrow other cells or tissues that have been lost due to injury or disease. Although the field has shown much promise in animal studies and even a few early-stage clinical trials, a potential problem in the technology is that these engineered stem cells can grow too well and lead to cancer. A multidisciplinary team from Memorial Sloan Kettering has tackled this problem and come up with a possible solution. 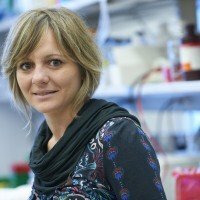 Led by research fellow Elisa Oricchio, the scientists introduced a gene into the reprogrammed cells that could be switched off if needed, killing the engineered cells that had become cancerous while allowing the healthy ones to continue growing. The research builds on techniques developed to convert adult cells such as skin cells into induced pluripotent stem (iPS) cells. These iPS cells have the potential to form almost any cell type in the human body — including nerve, pancreas, or liver cells, for example — and are genetically matched to the patient they are being used to treat. With just a few exceptions, such treatments are still the stuff of science fiction. However, these techniques have been studied widely in animal models, especially mice. And researchers have discovered something alarming: Up to 20 percent of these engineered cells turn cancerous in animal models. In the current study, the particular therapeutic cells used were iPS cells that had been programmed to form dopamine neurons, the type of brain cells that are lost in Parkinson’s disease (PD). MSK developmental biologist Lorenz Studer, who was a coauthor on the Cell Reports paper, has been developing and refining these therapeutic cells for the treatment of PD for more than a decade. The gene used as a kill switch in the current research, called OMOMYC, is an inhibitor of a major cancer gene called MYC. The investigators engineered the OMOMYC gene into the dopamine neurons, along with a reporter gene that causes tumor cells to glow, making them easy to detect in laboratory mice. After inserting the engineered dopamine neuron cells into the brains of the mice, the investigators found that some of the animals developed brain tumors. They then showed that when the MYC gene was turned off, which was done by giving the mice a drug, tumors were induced to shrink. At the same time, normal neurons derived from the stem cells were not affected. This indicated that OMOMYC can selectively kill the cancerous cells without touching the newly made neurons. The MSK team is currently adding the OMOMYC kill switch to other types of engineered cells to test the effects. For example, one application may be T cells that are designed to treat certain types of leukemia and other cancers. These T cells are already in a handful of clinical trials at MSK. This research was supported by the National Institutes of Health and an NYSTEM grant. where I am today. To those of you that are fighting cancer please, try to stay strong and be very positive because God is with you and he'll get you through every gruesome treatment. Know that as long as you are alive you have the change to defeat the enemy "CANCER". Just hang in there. What about John Kanzius ? Are they not on the right track ? I would like to know if any similar trials are planned for Advanced liver Cancer. I have stage IV liver cancer with spread to spine. I would be greatly interested in any trials that may possibly benefit me. Vic, we are sorry to hear about your condition. This approach is still new but if you are interested in learning whether there are any clinical trials at Memorial Sloan Kettering that might be appropriate, you can contact our Physician Referral Service at at 800-525-2225 or go to http://www.mskcc.org/cancer-care/appointment.